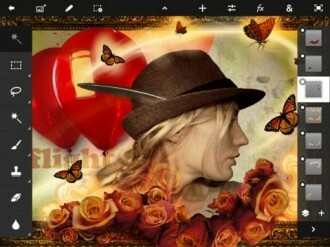 Adobe has officially launched Photoshop Touch for iPad 2 in the App Store. The app debuted ahead of schedule on Saturday and was subsequently pulled from several worldwide stores before being reintroduced a day later. The application was first announced in October 2011 along with five other apps and is essentially a more powerful version of the free Photoshop Express app that’s been available for a couple of years. The same app has been available to Android users for a while now. PS Touch features core components found in the popular desktop version as well as tablet-specific additions. PS Touch supports layers, selection tools, adjustments and filters to create and manipulate images. Users can select part of an image to extract using the Scribble Selection tool and with the Refine Edge tool, highlighting hard-to-select elements like hair is extremely easy. New tablet features include the ability to share images on Facebook and view comments from within the app. There are step-by-step tutorials designed to teach techniques that pros use on a daily basis. Users can upload projects to Adobe Creative Cloud and open layered files from PS Touch in Photoshop CS5. The only obvious drawback is that images are limited to a maximum resolution of 1,600x 1,600 pixels, which may or may not be a deal-breaker. Adobe Photoshop Touch for iPad 2 is available now in the App Store for $9.99. Note that it isn’t compatible with the original iPad (seemingly because of the single-core processor). The same app is available in the Android Market at, you guessed it, $9.99.